For almost two years the European Commission and a group of most influential Member States (such as France, Germany and Italy) have been pushing the development of new initiatives in area of defense. The presentation of the Global Strategy of the European Union’s Foreign and Security Policy in June 2016 marked a major milestone in this area. The document includes several provisions regarding the need to strengthen Europe’s security and specifies EU’s role in the process. A number of later events amplified the tendency towards building some sort of a European defense union. Among them, the most important ones include the Brexit referendum, the aggressive actions of the Russian Federation towards neighbors and Western countries, the election of Donald Trump to the office of the President of the United States of America, as well as armed conflicts in the EU’s southern neighborhood and the resulting migration crisis. 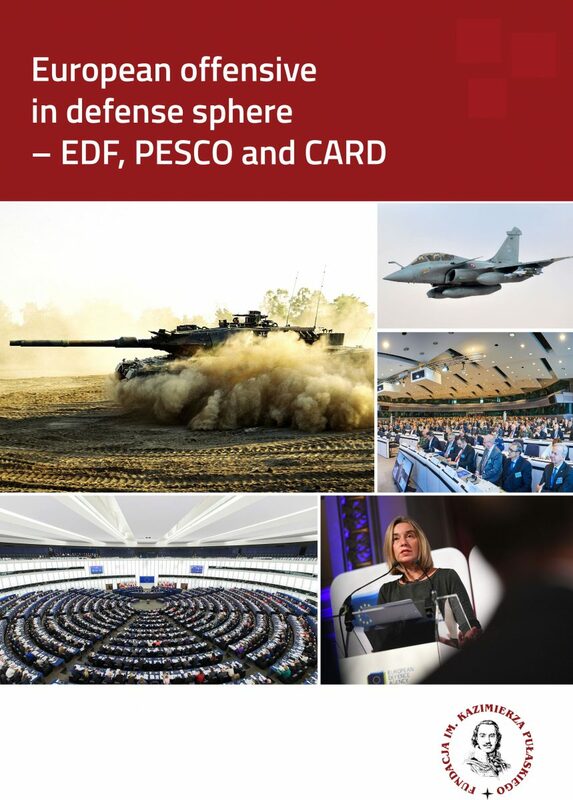 This report is a collection of articles concerning three programs (EDF, PESCO and CARD) of the new EU defense package, which have been published in the ‘Wojsko I Technika’ monthly magazine, in the first half of 2018. Since the initiatives that are now coming into force are closely related, they should undergo joint assessment. Authors of the articles have repeatedly pointed to the connection between the European Defense Fund, Permanent Structural Cooperation and the Coordinated Annual Review on Defense. Success or failure of any one of them will have a severe impact on the functioning of the others. This in turn affects the chances of creating a European defense union, which currently seems to be within reach. Failure to take advantage of the existing opportunity might plunge EU’s common defense initiative back into a period of lethargy, which it emerged from not too long ago.